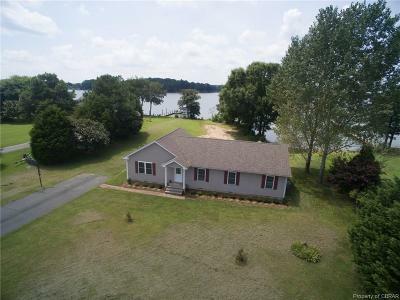 Come enjoy the Rivah at this turnkey home! Sweeping views of the Little Wicomico greet you as you enter. The great room/dining combo features vaulted ceilings & a wall of windows facing the water. This spacious room has a southwestern exposure, making it perfect for catching the summer breezes & amazing sunsets! The kitchen is open to the great room & there are fantastic views from the sink & kitchen bar. After a day of playing on the water, the home has a mudroom & bath w/ exterior access, so you can get cleaned up without making a mess. The master bedroom has a private deck, great views, & master bath. There is room for the whole gang w/ 3 guest bedrooms. With a huge deck, concrete patio, sandy shoreline & dock w/ 4’ MLW, there is plenty of space to enjoy the great outdoors! Directions: Heading SE On Us-360e Towards State Rte 644, Turn Left Onto State Rte 664/Hacks Neck Rd. Continue 5.5 Miles. Turn Right Onto State Rte 644. Continue 1.3 Miles. Turn Right Onto Richard Rd. Turn Left Onto Surry St.